In the compact crossover segment, the 2013 Chevrolet Equinox, with standard front-wheel drive and available all-wheel drive, impresses with exterior styling, a roomy and comfortable cabin, a revised and more powerful optional V6 engine, and new available features including a rear-seat entertainment system, a revised touchscreen interface, smartphone app integration, power passenger seat, and universal garage door opener. Where the Equinox stands out is in interior spaciousness, more approaching a midsize than a compact - but no third-row seat available. The compact crossover is also remarkably quiet and has a premium look inside and out. In the view of many automotive reviewers, the 2013 Chevrolet Equinox has more than a fair amount of things in its favor, with a few notable complaints. Depending on the powertrain selected, the Equinox can be a great driving vehicle or a sluggish performer that gets good fuel economy. Maneuverability, say some members of the motoring press, is a bit less than competitors like the Ford Escape, Kia Sportage, and Volkswagen Tiguan, but overall, the compact crossover has a well-rounded nature that makes it one of the segment's top choices. Owners who have commented on user review sites such as Kelley Blue Book, Edmunds, MSN Autos, Cars.com and others, almost universally applaud the comfort, quietness, performance and quality of the 2013 Chevrolet Equinox with the new V6 engine. Comments include "very nicely done," "pleasantly surprised," "I didn't expect a Chevy to be this good," an "outstanding vehicle," and more along these lines. One owner review on MSN Autos called the 2013 Equinox the "best car," and went on to recommend the crossover to anyone. "I bought [the four-cylinder] mostly for gas mileage but this car is comfortable and roomy." Another owner commented on Cars.com that the Equinox was the "best SUV I've ever had," elaborating further that "I've had a few SUVs, most recent before the Equinox was the Cadillac SRX, very small and pricey for the quality! The Equinox beats it hands down." Other owners remark that the ride, handling, fit and finish were deciding factors in their choice of the Equinox over competitors such as the Honda CR-V, Toyota RAV4 and Ford Escape. Complaints include blind spots because of the position of the side mirrors, and wide front-seat headrests that result in a blind spot when looking to the right. Some short drivers say it's hard to position the seat to comfortably reach the gas pedal. Other owners comment that the Equinox is a nice car but the four-cylinder needs more oomph and one noted that tire road noise is especially noticeable and distracting on coarse paved roads. Three trim lines are offered in the 2013 Chevrolet Equinox: LS, LT and LTZ. The LT trim is subdivided into 1LT and 2LT. Standard equipment on the base Equinox LS includes 17-inch alloy wheels, cruise control, keyless entry, air conditioning, full power accessories, a driver's seat with only height adjustment powered (other adjustments are manual), sliding/reclining rear seat, tilt-and-telescoping steering wheel with audio controls, Bluetooth phone connectivity, OnStar emergency communications, and a six-speaker AM/FM/CD/satellite audio system with auxiliary audio jack and iPod/USB interface. The 1LT Equinox gets heated mirrors, a rearview camera, rear privacy glass, roof rack side rails, upgraded cloth upholstery, a leather-wrapped steering wheel, and a better sound system with a seven-inch touchscreen and an iPod/USB interface. Next up is the 2LT, which adds remote ignition, fog lamps, heated front seats, an eight-way power driver's seat, automatic climate control, an eight-speaker Pioneer sound system, and an auto-dimming rearview mirror. The top-line LTZ model boasts perforated leather upholstery, an eight-way power passenger seat and driver memory functions, automatic headlights, a power liftgate, and rear parking sensors. The LTZ with V6 engine also gets a firmer suspension tuning. For customers who want to dress up lower trims, they can add many of the standard features found on the upper trims by selecting optional packages. Some other available options include 18- and 19-inch chrome-clad alloy wheels, a navigation system with MyLink smartphone app integration, including Bluetooth audio streaming, a sunroof, and a dual-screen rear-seat entertainment system. There is also a safety package that includes rear parking sensors, and collision-warning and lane-departure warning systems. Although the standard engine in the 2013 Chevrolet Equinox is a 2.4-liter four-cylinder engine that delivers 182 horsepower and 172 pound-feet of torque, the real news, according to every automotive review, is the replacement of the former optional 3.0-liter V6 engine with a much stronger and more powerful 3.6-liter V6. The new V6, available on all trims except the LS, makes 301 horsepower and 272 pound-feet of torque. A six-speed automatic transmission and front-wheel drive are standard on all Equinox models, regardless of engine size. All-wheel drive is optional. Kelley Blue Book comments that the new, larger V6 engine is notable for good off-the-line acceleration and plenty of passing power, two traits missing from the outgoing V6. Fuel economy, as noted by the auto press, is best with the four-cylinder engine, although that comes at the expense of performance. Four-cylinder Equinox engines are EPA rated at 22 mpg city/32 mpg highway/26 mpg combined in front-wheel drive, and 20/29/23 mpg with all-wheel drive. Some reviewers, including Edmunds, note that in their experience with the four-cylinder powered Equinox, the fuel economy numbers are short of the EPA estimates. V6 fuel economy is estimated by the EPA at 17 mpg city/24 mpg highway/20 mpg combined (front-wheel drive) and 16/23/19 mpg with all-wheel drive. Some in the automotive press complain that the Equinox doesn't feel at home on twisting roads, due to a suspension that favors comfort over cornering. Where the 2013 Chevy Equinox shines, agree most reviewers, is in its stylish cabin filled with premium touches. Even though some in the auto press remark that the materials themselves are only of average quality, the overall impression of the Equinox's cabin is that it looks richer than competitors in the segment. Spending time in the Equinox means driver and passengers are rewarded with comfortable seats. It's also easy for the driver to find a good driving position, thanks to the tilt-and-telescoping steering wheel. Headroom and legroom are ample. Rear seats come in for praise as well, with reviewers noting the 60/40 split rear seats that slide forward to handle more cargo, or back to accommodate taller passengers. Like most vehicles in the compact crossover segment, the five-passenger Equinox lacks a third-row seat. Cargo space is good, at 63.7 cubic feet with the rear seat folded down. With the rear seats in the upright position, the Equinox has 31.4 cubic feet of storage. The optional power-programmable liftgate also gets high marks from reviewers. Most reviewers laud the strong safety and reliability scores in the 2013 Chevy Equinox. Standard safety features include front seat side airbags and side curtain airbags, antilock brakes, traction and stability control, and the General Motors OnStar emergency communications system, which includes automatic crash notification, stolen vehicle assistance, and remote door unlock. All trims except the base LS are equipped with a rearview camera as standard equipment. The top-of-the-line LTZ includes standard rear parking sensors, and a safety system with collision warning and lane departure alerts. In government crash tests from the National Highway Traffic Safety Administration (NHTSA), the 2013 Chevrolet Equinox earned an overall four star rating out of a possible five stars, and four stars for frontal crash protection and five stars for side protection. The Insurance Institute for Highway Safety (IIHS) gave the 2013 Chevrolet Equinox a Top Safety Pick designation as a result of a"Good" rating in frontal-offset, side-impact and roof-strength crash testing. 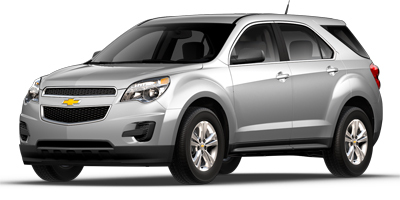 Reliability for the 2013 Chevrolet Equinox is better than most. That's according to the four-circle Predicted Reliability score from the J.D. Power and Associates Predicted Reliability Rating. Interested to see how the 2013 Chevrolet Equinox ranks against similar cars in terms of key attributes? Here are the 2013 Chevrolet Equinox rankings for MPG, horsepower, torque, leg room, head room, shoulder room, hip room and so forth.